So, it is over for 2016. As a first-time participant in the Aussie Backyard Bird Count, it has been a rewarding experience. The Bird Count has provided twenty minutes of enjoyment each day for a week: a time to relax and take note of nature at work and play. I have to admit to being surprised at the number of birds, and variety of species, to be seen (and heard) in our locale. 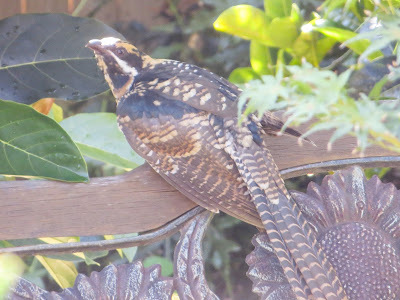 Over the seven days, I was able to witness a total of 395 birds, of 21 species, which I was confidently able to recognise, as well as a number for which I could make no certain determination. It was also interesting to note the differing patterns of bird visits from morning to evening. About one-third of our sightings during the Great Aussie Backyard Bird Count was of Rainbow Lorikeets. 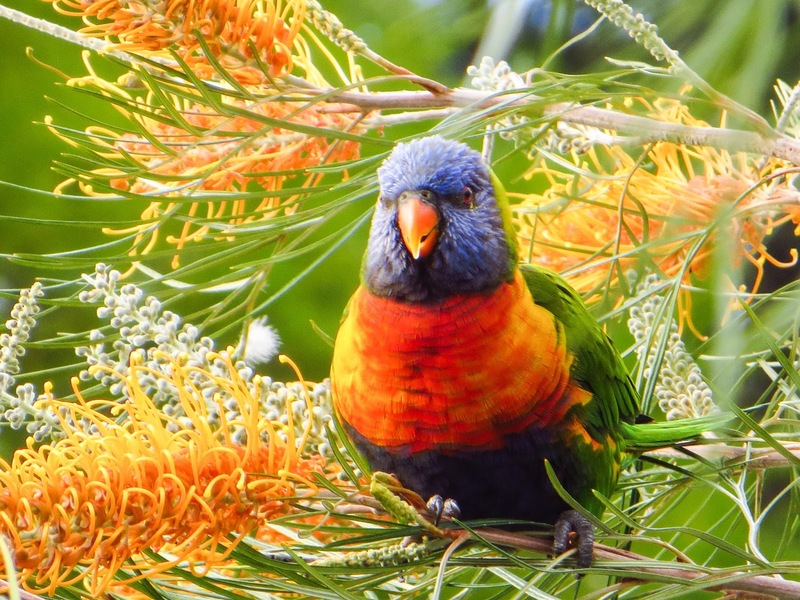 At this time, the lorikeets are attracted to the area by a number of majestic spring-flowering Silky Oak (Grevillea robusta) trees. When the Silky Oaks are no longer in flower, the lorikeets will seek out smaller grevillea shrubs in local gardens, feasting on the nectar. 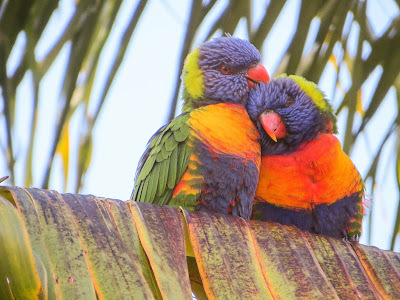 Rainbow Lorikeets are most prevalent in the evening when they return to their roost trees... in our locale, these societal roost trees are magnificent Eucalypts. Our second most common visitor during the Bird Count was the Noisy Miner. Towards many other birds, it can be very aggressive. Noisy Miners appear to have little fear, often to be seen chasing away much larger birds such as Crows and Currawongs. For me, the Noisy Miners are wonderful, protective parents, highly adapted to suburban life in a large city. 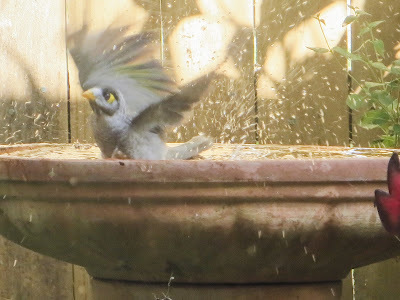 They also quickly become accustomed to living with people and pets: our Noisy Miners do not take to flight when the house cat walks under their tree! The Common or Indian Myna is not an Australian native bird. Native to Southeast Asia, they are, however, in profusion in our neighbourhood. These highly-invasive Mynas appear to prefer homes with open and grassed areas, rather than one which is heavily planted. It was the third most-commonly sighted bird during the seven days of our survey. A young Common Blackbird which appears to have made our yard home... Another introduced species, the Common Blackbird was also one of the most easily sighted birds during the survey. Unlike the Myna, the blackbird appears to be encouraged by heavy plant cover. It can be spotted, morning and afternoon, fossicking for worms and other invertebrates under trees and shrubs, disturbing our garden mulch. An Australian Raven or Crow ready to fly from its perch in a Jacaranda tree. On this occasion, it was being hurried along by some harassing Noisy Miners. The Aussie Backyard Bird Count occurs again next year from October 23 until October 29. I heartily recommend your participation, either online or by downloading the app to your smartphone.